NORCROSS, Ga. - The Saab 9-3 range for 1999 features the new Saab 9-3 Coupe, 9-3 5-door and 9-3 Convertible. All Saab 9-3 models are powered exclusively by turbocharged engines and offer a combination of excellent performance, an outstanding level of safety and superb driver control. The Saab 9-3 (pronounced "nine three") was first introduced in May, 1998 as an evolution of the Saab 900 line and provides a performance inspired update of the 900's distinctive styling along with more than 1,000 technical improvements and interior design changes. Now, only half a year later, Saab's engineers have further refined the Saab 9-3 in several respects to enhance the driving experience. The 1999 Saab 9-3 models are available with two different 2.0 liter Saab Ecopower Turbo engines; the new 200 hp high output turbo engine in the Saab 9-3 SE 5-door and SE Convertible variants with manual transmissions and the 185 hp engine for all other Saab 9-3 Coupe, 9-3 5-door and 9-3 Convertible models. Saab's new 200 hp 2.0L high output turbo four-cylinder engine delivers its maximum horsepower at 5,500 rpm and strong low-end torque of 209 lb. ft. at just 2,300 rpm. Because the amount of torque and where it's available in the rev range dictates the driveability and acceleration capabilities of a vehicle, this Saab engine maintains its maximum torque all the way up to 4,600 rpm. This broad, flat plateau of maximum torque provides usable power on demand for overtaking, avoiding potential hazards, or sheer driving enjoyment. The high output turbo equipped Saab 9-3 SE 5-door is capable of accelerating from 40-60 mph in fourth gear in just 5.9 seconds and from 50-70 mph in fifth gear in only 9.4 seconds. The Saab 9-3 SE high output turbo is the latest offering in a long line of dynamic Saab turbocharged cars. Saab presented its first turbo car in 1976 and has been optimizing turbocharging technologies ever since. Through the years, Saab has introduced such advanced engine systems as Automatic Performance Control (APC), Saab Direct Ignition and Saab's Trionic engine management system. Saab's Trionic engine management system simultaneously monitors and controls Direct Ignition timing, fuel injection rate and maximum turbo boost pressure using a 32-bit microprocessor capable of making two million calculations per second. Today's Saab turbo engines are labeled Ecopower and offer a unique combination of high performance, low emissions and good fuel economy. With its newest turbo engine, Saab now provides 100 horsepower per liter of engine displacement - an efficiency virtually unmatched in a family car, and traditionally only found in ultra high performance sports cars. The standard five-speed manual transmission includes a hydraulically operated clutch for ease of driving and smoother gear shifts. To improve low-end performance on the new 1999 models and to make the car easier to drive in city traffic, Saab revised the manual transmission gear ratios and installed a numerically higher final drive ratio of 4.05:1. These gear and final drive ratio enhancements provide quicker off the line response while maintaining highway cruising fuel efficiency. An electronically controlled four-speed automatic transmission with three driver-selectable shift modes � sport, normal and winter � is optional. The performance capabilities of all Saab 9-3's are able to be explored with the help of very precise steering, outstanding handling characteristics and excellent braking performance. The interior of the Saab 9-3 is designed with driver ergonomics as the main focus which gives the cabin, and especially the driver's seat, an evident cockpit feel. A direct influence of aircraft ergonomics, the Saab 9-3 is equipped with the Saab Night Panel function in the dashboard, which displays information on a need-to-know basis, with a choice of illumination modes and variable brightness. The new seats in the Saab 9-3 are wider and the seat bottom cushion extends further forward providing ample support and comfort during long drives. An 8-way power adjustable driver's seat is now standard equipment on the base 9-3 Convertible, while manual seats continue in base Saab 9-3 5-door and Coupe models. Driver comfort and convenience are critical elements of safe driving, therefore Saab introduces a new armrest and cupholder on fall introduction Saab 9-3 models. On 9-3 SE 5-door models Saab has integrated a fold-down armrest for the power driver's seat. The new cupholder, which is recessed in the instrument panel between the Saab Information Display (SID) and the radio, swings out when gentle pressure is applied and is much more accessible to the driver. The cupholder is a standard feature on all new 1999 Saab 9-3 models and compliments the existing console mounted cupholder, except on armrest equipped SE 5-door models in which the console mounted cupholder is eliminated. Two different climate control systems, designed to keep the occupants comfortable regardless of the outdoor climate, are available for the Saab 9-3 models. Standard level Saab 9-3 Coupe, 5-door and Convertible models continue to be equipped with a manual heating and ventilation system with air conditioning. All SE level Saab 9-3 models are equipped with a computerized Automatic Climate Control (ACC) system. The Saab 9-3 5-door and Coupe models continue to offer segment leading utility with trunk capacity of 21.7 cubic feet and cargo capacity, with the split fold-down rear seat folded, of a full 46 cubic feet. The split-folding rear seat has a pass-through opening behind the center armrest, or folds down partially or fully. Even the Saab 9-3 Convertible offers class-leading utility with its fold-down rear seat and full pass-through opening to the trunk. 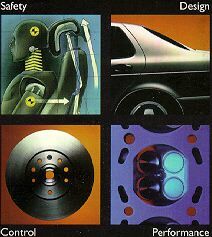 Saab engineers have always viewed occupant safety as one of the most vital attributes of a car's design. All safety work at Saab is based on the Real-life Safety concept � that Saab cars must be as safe as possible in accident situations that occur in the real world. It's one thing to design a car that performs well in controlled laboratory tests, it's entirely another to design a car that performs well in the infinitely variable conditions of the real world. To help ensure the collision qualities of new Saab models can be predicted as realistically as possible, Saab cars are designed using 25 years of real-life safety data accumulated by Saab experts in studies of more than 5,000 actual road accidents. Furthermore, all new Saab models are subjected to more than 40 different crash tests, although only 11 are mandated by government standards. The front structure of the Saab 9-3 is designed to absorb and spread energy from collisions away from the passenger compartment as much as possible. Combined with energy absorbing systems that collapse progressively in proportion to the impact speed, the 9-3's crash behavior is predictable and consistent, virtually regardless of what obstacle the car encounters. The Saab safety cage around the passenger compartment is made from an extremely rigid system of high-tensile steel members. Biomechanical studies of side impact injuries have resulted in a special collision deflecting side structure that Saab calls its pendulum "B" pillar. Simply put, kinetic energy from a crash is like water or electricity in that it will always take the path of least resistance. In Saab's pendulum "B" pillar our engineers have designed-in the path of least resistance to deflect crash forces away from the upper parts of the human body, which are more susceptible to injury. The Saab Active Head Restraint (SAHR) is a unique new safety system that reduces the risk of whiplash injuries. This world-first safety feature effectively limits the front-seat occupants' head movement during a rear-end collision. The beautifully simple design of the SAHR system requires no electronics, sensors, or pyrotechnics to function. Since the SAHR system is fully mechanical, it can function time and again as needed and there are no specific parts that have to be replaced after its use in an accident. The SAHR system is standard equipment on all Saab 9-3 variants, indicative of Saab's genuine concern with Real-life Safety. The Saab 9-3's extensive standard safety equipment list also includes dual-stage head and torso protecting side-impact airbags, integrated into the outside bolster of the front seatbacks. When activated, the airbags inflate in two stages. The bottom section of the bag is inflated first to protect the torso, which is the first part of the occupant's body at risk from side-impact collision forces. While the lower section of the bag is fully inflated, the upper section of the bag is gradually inflated. The top section of the airbag then fully inflates, with the assistance of pressure from the lower section allowed through check valves when the occupants' torso contacts the lower bag area, to offer protection for the head. All five seating positions incorporate three-point inertia reel seat belts and anti-submarining ramps to prevent the occupant from sliding under the belt in a severe frontal collision. Front seats also feature seat belt pre-tensioners. A rear integrated child seat is available as an option. Another safety enhancement on the 1999 Saab 9-3 is a newly designed ceiling headliner with additional padding in those areas where the driver's or passengers' heads might strike in the event of a crash. All Saab 9-3 models are equipped with one of the industry's most sophisticated anti-theft systems. An ingenious system of cylinders and striker plates causes the lock cylinders to rotate freely if an attempt is made to unlock the door by using some form of skeleton key, or if a tool is used to attempt to break into the car. The alarm system has a number of electronic and mechanical components, including a glass-breakage sensor and alarm triggers for the doors, hood and tailgate, all of which are linked into a common control unit. All Saab 9-3 cars are equipped with an electronic immobilizer that prevents the engine from being started unless the correct key is used. The computer gives the key one of over four billion security codes each time the key is removed from the ignition. The popular Saab 9-3 Convertible continues to offer generous room for four occupants, as well as four-seasons comfort, sports car performance and a comprehensive list of standard features for exceptional value. The power operated soft top of the Saab 9-3 Convertible is operated by hydraulics and is secured to the windshield header with a single, centrally located handle. The top lining is a light gray fabric which, together with the large rear window, helps make the interior brighter. A thick insulating layer (6 mm) and carefully designed seals between the top and the windshield header contribute to make the Saab 9-3 Convertible one of the quietest convertibles around. Additional enhancements to the new 1999 Saab 9-3 include new 5-spoke, 16-inch light-alloy wheels for the SE models and a new blue/gray mica-metallic body color; Frost Gray. Saab's excellent warranty protection for all 1999 models includes four-year/50,000-mile bumper-to-bumper coverage with 24-hour roadside assistance, and six-year coverage for perforation, with no mileage limit. Saab's first maintenance service is performed free of charge. The 1999 Saab 9-3 features more than 1,000 new or modified components. Following are the most significant revisions or additions to the new 1999 Saab 9-3 compared to the 1998 Saab 900. Improved front suspension, including tuning changes, modified upper strut mountings and new front struts with longer springs for increased wheel travel. 2.0L Turbo engine standard on all 9-3 models. A new 200 hp engine on all SE models with manual transmission and the 185 hp engine on all others. Revised manual transmission gear ratios and final drive ratio for improved low-speed driveability. New wheel design: 3-spoke "Delta" alloy 15-inch wheel for base 9-3 and a new 5-spoke, 16-inch light-alloy wheel for the SE models. Restyled front end includes new grille, bumper design, integrated fog lights, lower air intake, integrated spoiler. Restyled rear end includes new sheet metal and bumper design, new taillights, relocated license plate, new badging. LED high-mounted brake light with integrated rear washer nozzle. Exterior handle for tailgate, strengthened latch system. Improved convertible power top � now hydraulic with single, centrally located fastening handle, larger rear window, integrated rain channels over doors, improved sealing, increased sound insulation. Anti-theft alarm includes tamper-resistant, free-rotating door lock cylinders, engine immobilization, sensors for doors, hood, glass breakage (except convertible), and trunk. New front seats with Saab Active Head Restraint (SAHR) system. Saab pendulum "B" pillar structure for improved side-impact protection. Head and torso protecting side airbags. Integrated, fold-down driver's seat armrest for the five-door SE models. Centrally located, instrument panel integrated cupholder. New ceiling headliner with additional padding for occupants' head protection. New automatic gear selector, and gear selection display in instrument panel. Improved climate control system featuring higher capacity blower and air inlet, new defrosting ducts, new AC compressor, new manual controls and new Automatic Climate Control (ACC) programming and display. Change in interior dashboard and upholstery colors, and upholstery patterns. Improved information message display/Saab Car Computer. Rear overhead individual reading lights, new location for light switch. Revised audio systems, including choice of in-dash CD or cassette player.